Improved Hispi. Pointed summer/autumn variety that is ready approximately 75 days after sowing. Not suitable for autumn sowing. Treated Seed. 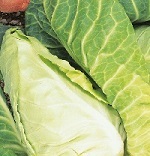 Pointed 'sweet heart' type but can also be cut for greens. Sow in succession from early spring for cropping over a long period. Red tinged, lightly savoyed leaves leaves Sweet and crisp. Sow March to April for cutting November and December. Hardy, round-headed variety, with purple tinged leaves. Sow April-May. Harvest from early December to end February. Club root resistant ballhead. Late summer to autumn cropping. Sow March-April. 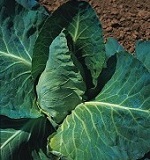 The solid round heads of this traditional variety are harvested from mid-September to end-December. Sow late March-April. Very hardy. Sow late March-April, harvest from Christmas to end of March. Spring cutting round head variety for sowing August to September. 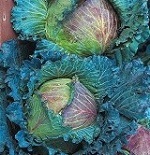 Very hardy, with medium to dark green dense round heads. Sow March to end of May. Harvest from early November to early March. New to us but an old favourite. 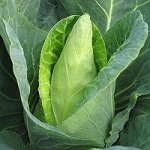 Very versatile pointed variety that can be sown in autumn for early spring greens, followed by hearting cabbage. Or sown in spring for summer/autumn cutting.